Today’s comic is from The Born Loser, which was first started by Art Sansom in 1965 and is now drawn by his son, Chip. This one appeared on October 3, 2013. Well, I think we all know the answer: it’s not the athletic part, it’s the shoe. Here’s a comic from a few weeks ago, on April 27. Frank and Ernest is usually predicated on some sort of really bad pun and this one is no exception. Here’s a comic from Carpe Diem, a Swedish strip by Niklas Eriksson. This one was published on March 31, 2017. Lego jokes are getting old, but that’s a slightly different take on them. 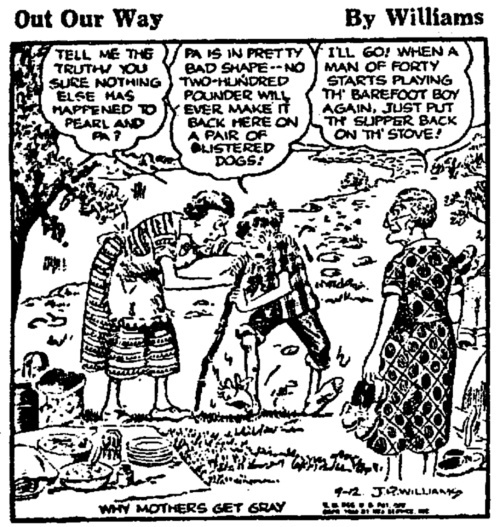 For our comic today let’s go back to an Out Our Way from September 12, 1949. The strip was drawn by J. R. Williams. If you are not used to going barefoot a lot, you really do need to work up to longer distances. The real question here is why is the kid in pain. As we are well aware, kids back then (well, country kids at least) went barefoot all summer long (and, from conversations I’ve had with some of them, could easily run on gravel).